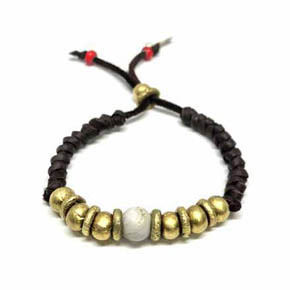 This nature inspired bracelet features brass beads, hammered brass roundels, and a conch shell center strung on deerskin leather. Detailed bone beads provide the focal point for this bracelet, braided deerskin leather achieves a look of style and comfort for the wearer. 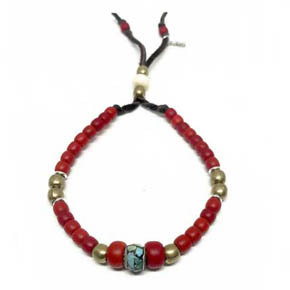 Celebrate color by adding this festive piece to your arm, alluring red African beads encompass turquoise, brass, and bone, as well as, sterling silver spacers on black deerskin leather. A one of a kind piece that stands alone or pairs well with others. 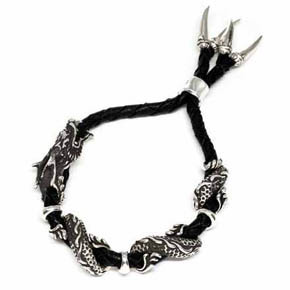 A handcrafted sterling silver dragon on braided black leather, bracelet includes a sterling silver roundel closure and sterling silver tips. The evening becomes you with a dash of darkness, the perfect limited edition bracelet to add to your wardrobe. 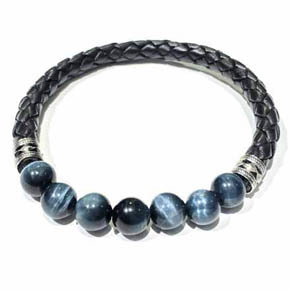 Bracelet features blue tigers eye beads surrounding a sapphire stone rondel. 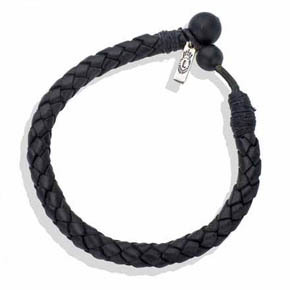 Bracelet pairs well with others or wear individually. 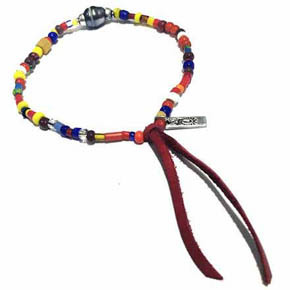 Unique and artistically handmade, this bracelet is construsted of African trade beads and sterling silver details surrounding a South Sea pearl. The look is completed with red deerskin leather trimmings. 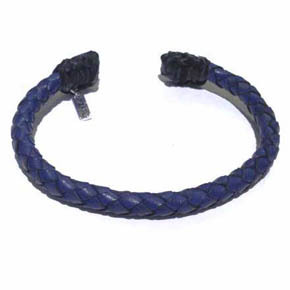 Don't be afraid to wear this navy leather cuff, capped off with black woven closures for a dashing, dapper look. Have a look that is dressed to kill with a red leather cuff, capped off with black woven closures. 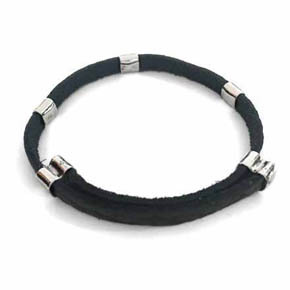 A classic black leather cuff with a thin, sleek look. This cuff features handwoven leather to complete any stylish look. 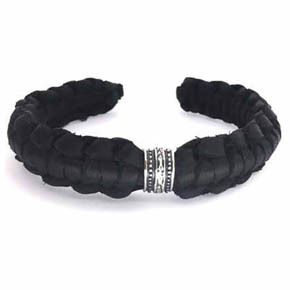 This black cuff is the newest wardrobe staple. A classic accessory for any occasion, featuring a handwoven leather comfort fit. 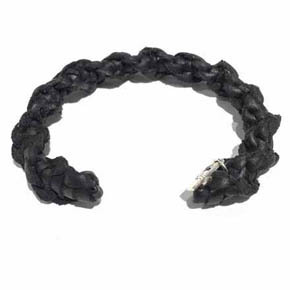 An instant classic, mens bracelet has the clean stylings and quality ingredients to make it a wardrobe staple. 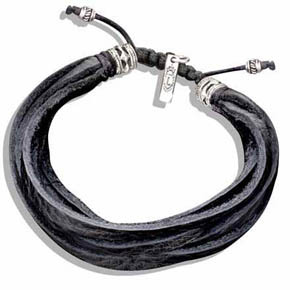 Sinch it up for a clean look of sterling silver and high grade soft lambskin leather. 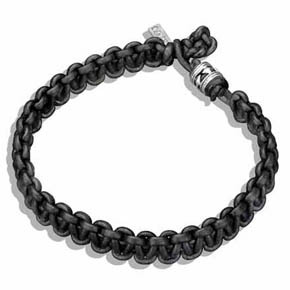 This masterly woven natural black leather bracelet for men features our signature detailed sterling silver finishes. Genuine black sting ray leather bracelet for men featuring a sterling silver white heart and fleur de lis detailed stainless steel snap. 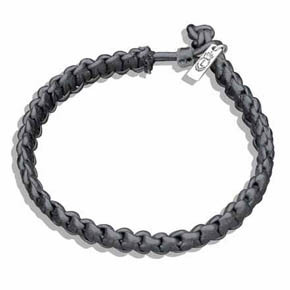 This 8.5"x1 3/8" men's bracelet is a great example of the hand laced luxury leather goods we offer. 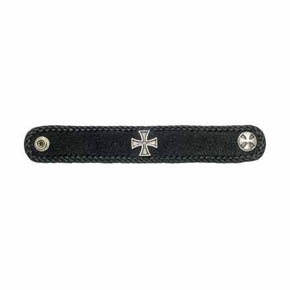 Maltese cross bracelet for men that is a hand laced men's bracelet made from genuine black sting ray leather. 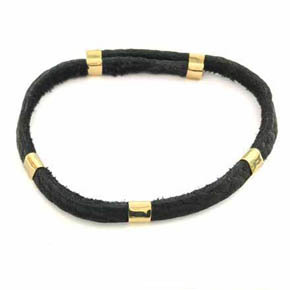 This stylish and comfortable creation is a longer version of our soft black lamb skin leather and brass horn tipped bracelet and necklace. Measures 70 inches tip to tip. 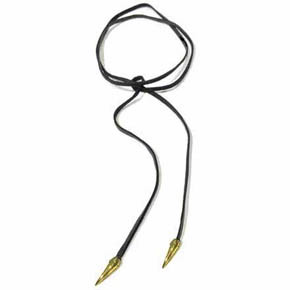 Worn as a bracelet or necklace this super comfortable creation features soft black lamb skin leather and brass horn tips. Measures 50 inches tip to tip. 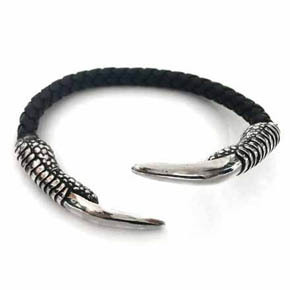 This versatile and comfortable creation features soft black lambskin leather and sterling silver horn tips and can be worn as a either a bracelet or necklace. Measures 50 inches tip to tip. 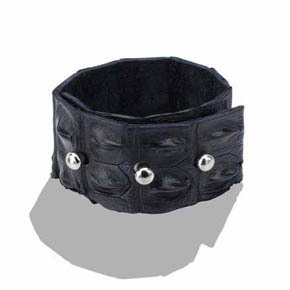 This 9.5" cuff with a stainless steel button is handmade from stingray and high quality leather. 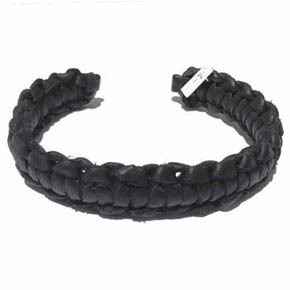 This handmade high quality braided black leather bracelet features a black onyx closure. 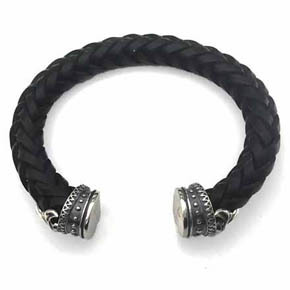 These handmade high quality braided black leather bracelets feature a knot closure. 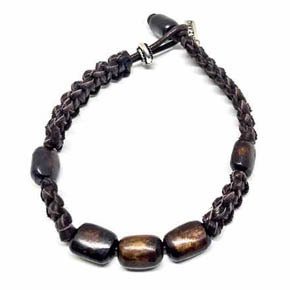 These adjustable handmade men's bracelets are made using multiple strips of supple buckskin leather with solid sterling silver caps. 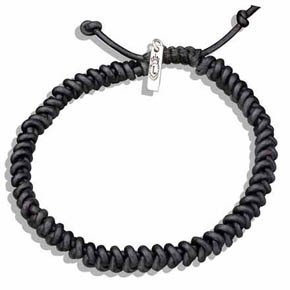 These handmade men's bracelet are made using high quality braided black leather and a sterling silver knotted catch. 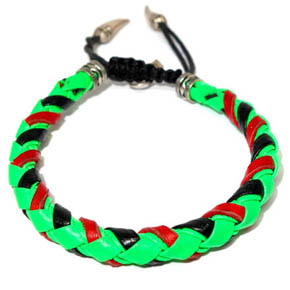 These handmade men's bracelets are made with high quality braided black leather and features an adjustable closure. 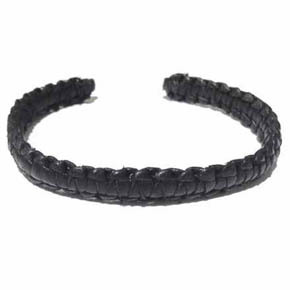 These handmade braided leather bracelets feature hand woven black leather. Don't over look this golden tigers eye paired with handcarved 60 year old Tibetan wood prayer beads accented with detail-rich sterling silver roundels. 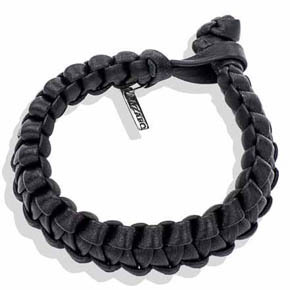 This men's bracelet is completed with deerskin leather trimmings. 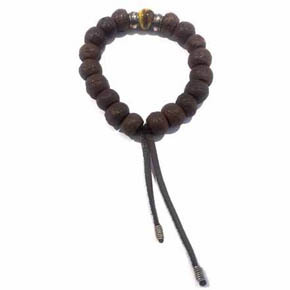 The ideal meditation bracelet is handcarved with 60 year old Tibetan wood prayer beads surrounding conch shell and detail-rich sterling silver roundels. 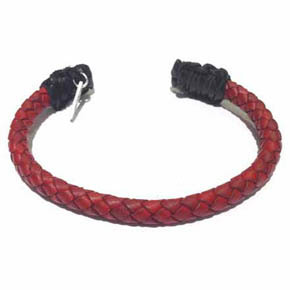 Bracelet is accented with deerskin leather trimmings. 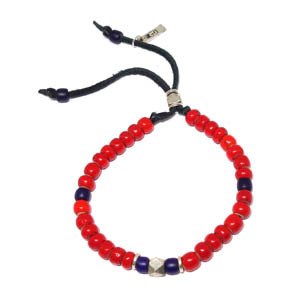 Together, African glass and wood beads pair well to create an uniquely, kaleidoscopic look featuring coral and sterling silver details and topped off with leather trimmings. Detailed in stunning brass, this black leather cuff looks good for a day at the office or a night on the town. The perfect men's accessory offering both style and comfort. 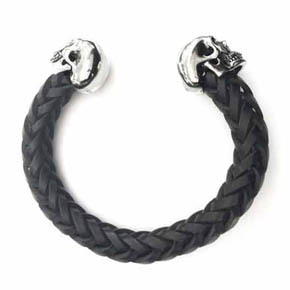 This skull cuff has a punch of style with the comfort that makes it the perfect accessory for daily wear. 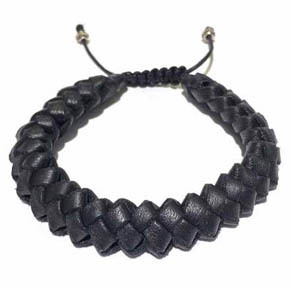 Look like a true rocker with this black woven leather cuff for men. Designed with comfort and style to help you perfectly accessorize your wardrobe. 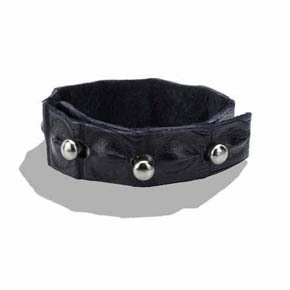 Add a touch of flair with this handwoven leather cuff, capped off with detail rich, sterling silver. 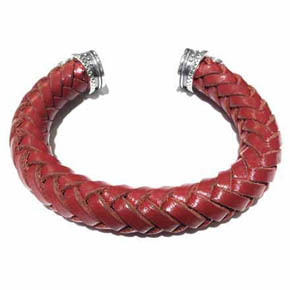 Let your adventurous side shine through with a bold red leather and detailed silver cuff. Dress up any outfit with this handwoven leather and sterling silver detailed cuff, great for a night out or a day at the office. 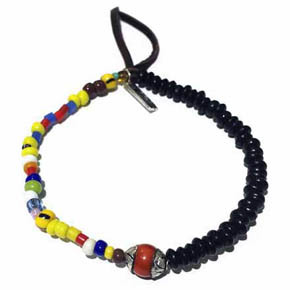 Harness nature's power with this hand woven leather bracelet featuring polished semi-precious gemstone beads. Four bead options available: yellow tiger's eye, blue tiger's eye, conch shell, and onyx. Mix and match bracelets for a bolder look. 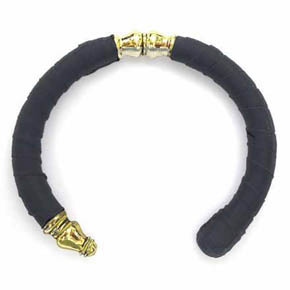 Upgrade your attire with this adjustable 18kt gold men's leather bracelet. 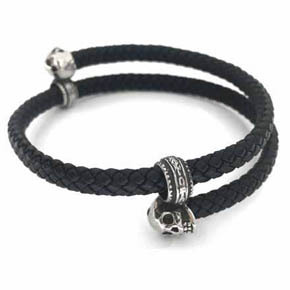 This semi-wrap bracelet features silver skulls with onyx eyes at either end balanced by our classic silver roundel ringlet and hand-woven leather through-out. 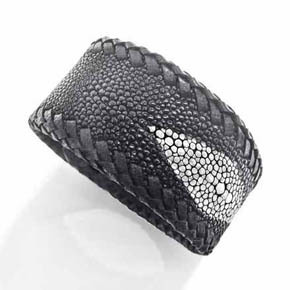 This modern and comfortable hand-crafted men's cuff in white brass features natural python wrapping. 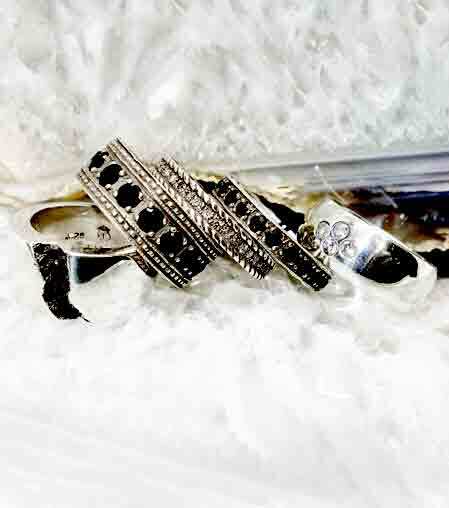 Also available in a sterling silver base-metal. 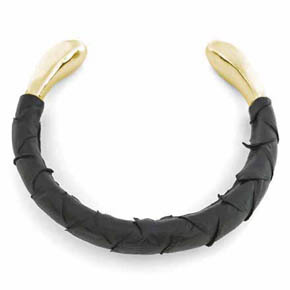 This yellow brass cuff features a modern and comfortable silhouette and is covered in natural soft python skin. 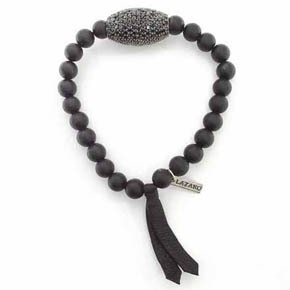 This bracelet for men features a generously paved faceted spinel and sterling silver bead centerpiece. 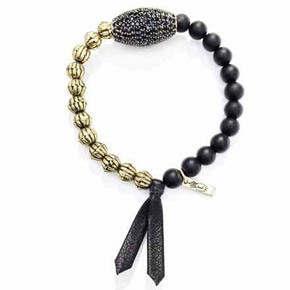 Equal amounts of brass and matte agate beads add detail to this designer bracelet. Hand strung on natural black lamb skin leather. 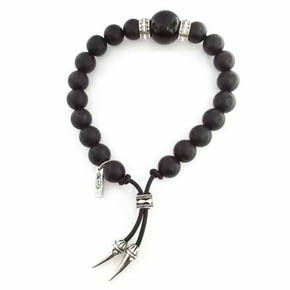 The centerpiece on this bracelet for men features a generously paved faceted spinel and sterling silver bead with accompanying 8mm matte black agate beads. Hand strung on natural black lamb skin leather. 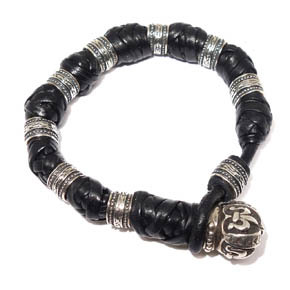 This adjustable men's bracelet features a black 12mm agate center bead flanked by sterling silver roundels and 8mm matte agate beads. 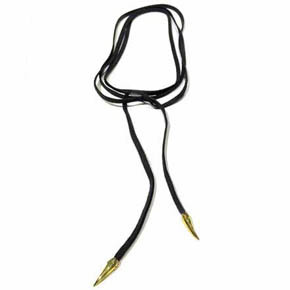 Strung on natural lambskin leather. 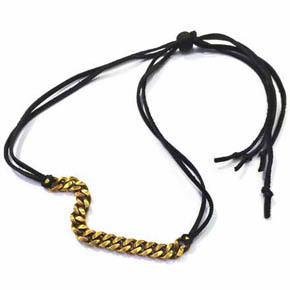 Stylish and versatile, we combined a yellow brass Cuban Link chain with our soft black lambskin leather in a creation that can be worn as a bracelet or necklace. Featuring a vintage Tibetan hand-carved wood pull. 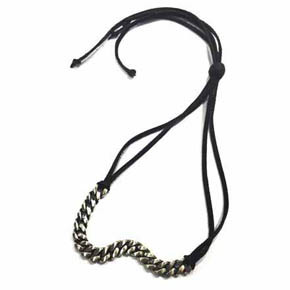 We mixed the ever stylish Cuban Link motif in white brass with a soft black lamb skin leather that can be worn as a bracelet and necklace. Featuring a vintage Tibetan hand-carved wood pull. Both a bracelet and necklace this 70 inch stylish creation is all soft black lamb skin leather accented with sterling silver horn tips. 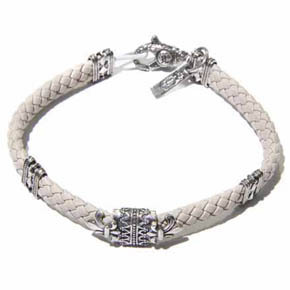 Men's bracelet featuring 30mm sterling silver fleur de lis and sterling silver clasp. 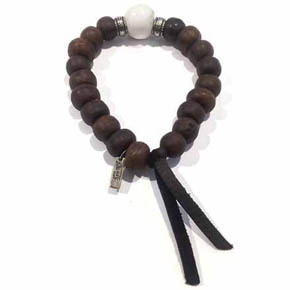 This 6mm ivory leather bracelet for men is hand woven. Small adjustable men's cuff made from high quality alligator leather and white brass. Cannot ship internationally. This medium handmade alligator leather men's cuff is adjustable and features white brass. Cannot ship internationally.